Free Shipping Included! 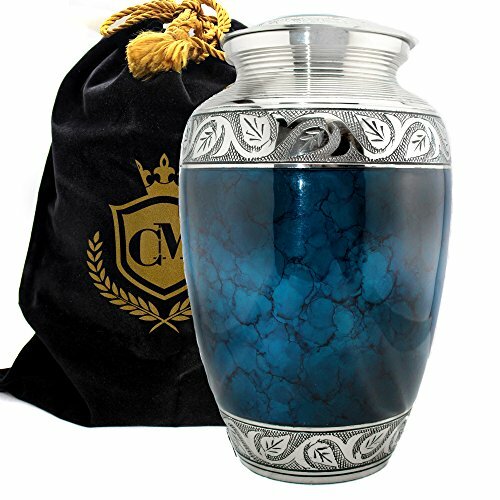 Moonstone Blue 100% Brass Burial or Funeral Adult Cremation Urn for Human Ashes - Adult, Large (Large) by Connolly Memorials at Muscle Pain Relief Rubs. Hurry! Limited time offer. Offer valid only while supplies last. The Moonstone Blue urn is a made of solid brass, individually engraved with a silver/pewter finish and enhanced with a vibrant mystic blue pattern. The Moonstone Blue urn is a made of solid brass, individually engraved with a silver/pewter finish and enhanced with a vibrant mystic blue pattern. Sealed with an epoxy clear coat to ensure no scratching. Each urn is handcrafted using a sand casting process that is hundreds of years old. Handcrafting provides each urn with its own unique variation in color, finish and texture -so no two urns are exactly alike. Truly, a one-of-a-kind urn to cherish your loved one. The urn has a screw-top lid for easy handling and is ideal for home, columbarium, scattering, or burial. Simply beautiful, the Moonstone Blue large/adult urn is a lasting tribute and a Keepsake is available separately. Ships with velvet bag. The large/adult urn holds up to 200 cubic inches of cremated remains (one pound weight prior to cremation equals one cubic inch). Dimensions: Approximately 10"H x 6"W. Due to the personal nature of this product we do not accept returns except for manufacturing defects or shipping damage. Always hand ENGRAVED to PERFECTION, ensuring each CREMATION URN is UNIQUE in design. This cremation urn features soft and rich tones of blue. This FUNERAL URN comes with a velvet gift bag and is approximately 10 inches x 6 inches and is ideal as a tribute within the home, or also as a BURIAL URN. If you have any questions about this product by Connolly Memorials, contact us by completing and submitting the form below. If you are looking for a specif part number, please include it with your message.